Like its competitors, T-Mobile is a bit obsessed with its customers' mobile data usage, but now that obsession may have gone too far. Following complaints from users and online video providers, the Electronic Frontier Foundation has examined the company's Binge On feature, which lets users watch video content from select T-Mobile partners without dinging their data cap, and revealed that the wireless carrier is throttling all HTML5 video content for users with Binge On enabled, regardless of the video provider's participation in the program. Initially announced as a way for customers to enjoy unlimited video content while on the go, T-Mobile partnered with Netflix, HBO Now, Hulu, Sling, ESPN, and others to offer "optimized" video streams at "DVD Quality" (480p at about 1.5Mbps). Users could watch an unlimited amount of content from these providers without the usage counting against their data caps. Google's YouTube, however, which did not sign an agreement with T-Mobile, quickly noticed that its video streams were also "optimized" for T-Mobile customers, resulting in poorer than expected quality and buffering issues. Such a scenario immediately introduces net neutrality concerns, so the EFF set out to test Binge On and determine what T-Mobile's technology was doing behind the scenes. The results indicate that this wasn't simply a tiff between Google and T-Mobile. 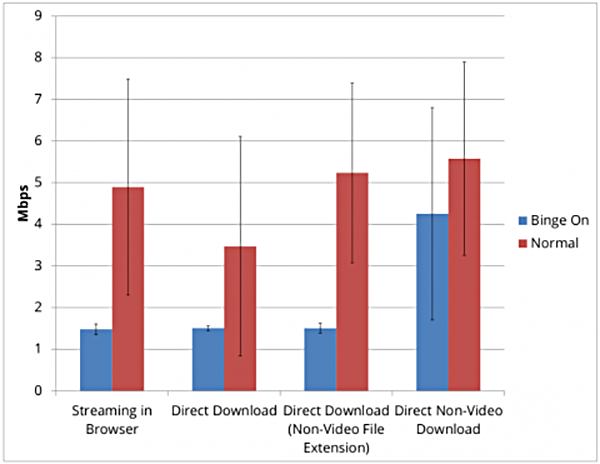 Rather, users with the Binge On feature enabled saw all HTML5-based video streams and downloads downgraded to about 1.5Mbps. The first result of our test confirms that when Binge On is enabled, T-Mobile throttles all HTML5 video streams to around 1.5Mbps, even when the phone is capable of downloading at higher speeds, and regardless of whether or not the video provider enrolled in Binge On. This is the case whether the video is being streamed or being downloaded—which means that T-Mobile is artificially reducing the download speeds of customers with Binge On enabled, even if they’re downloading the video to watch later. Worse, the EFF's analysis revealed that T-Mobile's video "optimization" consists of nothing more than simply throttling the streaming bitrate, with none of the visual improvements from "optimizing" that the company's advertisements of the feature suggest. This also means that if a video a user attempts to watch has a bitrate higher than 1.5Mbps but lacks features for adaptable quality, the user will be unable to watch the video without frequent buffering and stuttering. T-Mobile objects to the suggestion that the company is "throttling" a user's data, and insists on sticking with the term "optimize," but the EFF correctly points out that the lack of any processing other than a hard cap on video bitrate makes "throttling" the only logical description. 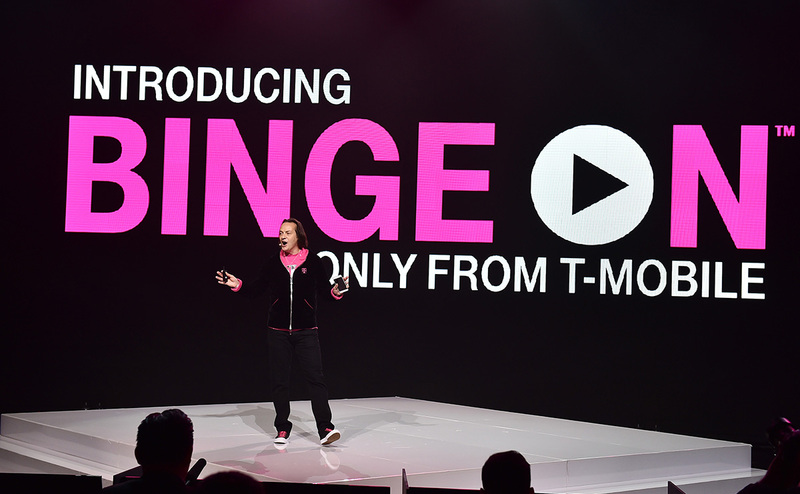 The good news for T-Mobile customers is that they can disable Binge On by changing their account preferences on the T-Mobile website, but the carrier's lack of transparency regarding the feature, coupled with the fact that T-Mobile automatically enabled Binge On for consumer-level customers without explicit consent, has led the EFF to call for an FCC investigation. T-Mobile has yet to publicly address the EFF's final report. The real kicker for T-Mobile customers? Even though the carrier is throttling all video streams and downloads, it still only exempts video provided by its Binge On partners from a user's data cap, meaning that you still got charged for that buffering, stuttering mess of an HD video you watched on YouTube last night.